Copper Forging or Brass Forging is the forging process utilizing copper or brass as the forging material. Copper alloys have good plasticity and strength, good abrasion resistance and thermal conductivity, especially good corrosion resistance in air and sea water. It has been widely used in electric power, instruments, ships and other industrial sectors. Most copper alloys have good plasticity at room temperature and high temperature, and can be forged smoothly. Even in the presence of tensile stress, they still have enough plasticity. A few tin-phosphorous bronze with high quality fraction of tin (such as qsn7-0.2) and lead brass with high quality fraction of lead (such as hpb59-1 and hpb64-2) have low plasticity and are sensitive to tensile stress. Qsn7-0.2 is a single-phase invariant solution at room temperature when deformation occurs under static tensile stress. Has the very high plasticity, can undertake cold deformation, but plasticity under high temperature is very low, the reason is that have low melting (alpha + delta + CU3P) eutectic at high temperature. Most copper alloys are not sensitive to deformation speed and can be forged on a press or hammer, but it is advisable to forge on a press. The phenomenon of heat effect is obvious when tin-phosphor-bronze and manganese bronze are forged. If the deformation speed is too fast, it is easy to overheat or even overheat due to the thermal effect. When the heating temperature is too high, the copper alloy grain grew up rapidly, reduce its plasticity, so the heating temperature of copper alloy are not more than 900 ℃. When the deformation temperature is below 650 ℃, the deformation resistance increases quickly. Before forging, we will first order cooper bars with the right specification (such as Φ30mm) from the material factory. When they are in stock, to insure filling the die cavity during forging, billets will be cut to a certain length according to the dimensions of final cooper forgings. Since the billet will be forged under hot condition, the billets are then heated to a certain forging temperature. 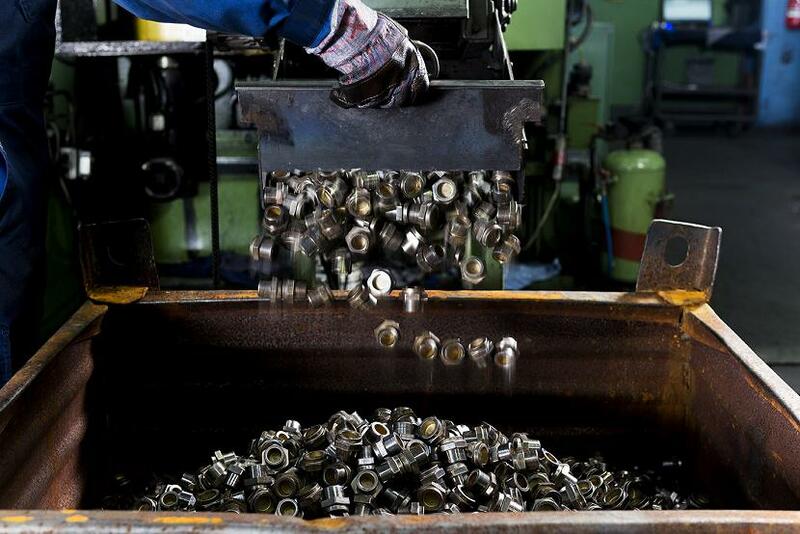 To insure a quality part, the forger must carefully control the billet temperature, as too cold the billet will not fill the die cavity completely whereas too hot it will result in a porous surface. The dies are heated to insure proper metal flow, and the heated billet is placed in the lower half of the die cavity. With a downward stroke of the forging ram, the upper die is forced against the billet to form the desired shape. Since copper and copper alloys are readily forged, most commercial forgings are produced with a single closing of the press, no re-strike or reheating being required. This permits the use of single cavity dies rather than the more expensive progressive dies required by hard-to-forge materials, and reduces labor costs, die costs, and heating costs. Forging rates vary between 100 and 1,200 pieces per hour with the majority of forgings being forged at 200 to 600 piece rates. Where quantities are large and the design is simple, considerable savings result from the use of multiple cavity dies, with more than one part being produced at a time. It is during this process that the dense grain structure of the hot wrought extruded brass rod is further hot worked to assure a dense uniform product with excellent physical and mechanical properties. These superior properties frequently permit the use of forged parts which are lighter than those produced by other processes. To insure complete filling of the die cavity, the weight of the forged copper part slightly exceeds that required by the finished forging. To allow for this excess metal, a gutter or relief area is provided in the die surface surrounding the die cavity. During forging, the excess metal is extruded into the gutter as overflow or flash which is removed later in a trimming operation. Good forging die design keeps the amount of flash to a minimum for minimum scrap. Since the flash thickness varies with the ram pressure on the die, the amount of excess metal, the billet temperature when forged, and the die temperature, the flash thickness dimension customarily has twice the tolerance allowed for other dimensions of the part. Where tighter outside dimensions are specified, a close trimming operation known as shaving can be substituted. During the forging process surface oxides form and the parts are coated with lubricants picked up from the dies. Both these surface layers are dissolved by dipping the parts in a series of special solutions. After the forgings are clean, they are generally dipped in a passivating bath to insure a clean surface for subsequent handling. Due to the stringent requirements of the Environmental Protection Agency, some forging suppliers have substituted a steel ball tumbling operation for dipping to clean cooper forgings. The most forgeable (hot) copper alloy is one with 38% zinc and a small amount of lead. This alloy is a two-phase alpha-beta brass at room temperature, but the hot-forging temperatures take the alloy into the single-phase beta region where deformation can easily occur. Lubrication requirements are generally minimal because the copper oxide that forms on the surface is a natural lubricant. Copper and its alloys exhibit good ductility and are generally considered as easy to forge. When hot forging, the preheat temperatures are typically 1350-1700°F. Brass and Bronze are among the most well-known families of copper-base alloys. Brass is typically a combination of copper and zinc. Hot brass forging provides for superior density and freedom from flaws, along with dimensional accuracy for duplication of parts. The single-phase alpha brasses are alloys of copper with up to 32% zinc. These alloys can also be strengthened by hot forging. An unusual property of these alpha brasses is that, in some cases, you can have an alloy with additional zinc and it is both stronger and more ductile than a leaner alloy. The alpha-beta brasses are two-phase metals containing 32-40% zinc. Bronze is predominantly copper combined with tin, aluminum, silicon or beryllium. Bronze is harder than pure iron and is more resistant to corrosion. Bronze is also harder than pure copper, and over time has been used for weapons, armor and tools. Copper alloy forgings offer a number of advantages, including high strength, closer tolerances and modest overall cost. Brass forgings are commonly used in valves, fittings, refrigeration components and gas and liquid handling products. Industrial and decorative hardware products also employ forgings. Most copper alloy forgings are hot formed in closed dies. Common forging alloys are the high coppers, C10200, C10400 and C11000, which exhibit excellent ductility, or high strength alloys, all of which exhibit the hightemperature ductile α+β phase structure. Copper forging provides higher production rates over copper casting. There is greater material strength in forged cooper parts due to the total absence of porosity. Forging improves the mechanical properties, because of the closeness of the grain flow. The absence of porosity and inclusions also significantly reduce scrap. The ductility of brass at forging temperatures allows for the easier formation of complex components; further the use of vertical and horizontal sub-presses enhances the application of multiple cores. The superior surface finish produced from copper forging over casting, means that grinding or sanding is not required before polishing; therefore it is easier to apply wide range of finishes. The closer tolerances and net shape accuracy provided by cooper forging reduce machining operations. Substantial material savings are generated due to the coring process along with the reduction in flash. Longer machine tool life is experienced due to the absence of the inclusions seen in sand casting. Lower Forge tooling costs over casting tooling. CFS Forge, the largest copper drop forging manufacturer and supplier in China, takes great pride in producing high-quality, closed-die brass and copper forged parts, specifically in the areas of automotive electrical components, aerospace, energy and defense industries. For over 30 years, our diverse customer base has trusted us to be part of their team, allowing us to help them create the often complex products they design. After thoroughly reviewing the specs in our APQP product review process, we work together with our clients to provide them with creative solutions for their unique designs. Closed-die forging, the process most widely used by CFS Forging Company, is the most cost effective forging process for high-volume production. The initial costs for the tooling and the equipment may be higher, but it can be an excellent investment long-term as the recurring costs of the parts is very low. Some of the numerous advantages to copper, brass and bronze forging includes close tolerances, strength, leak resistance and low overall costs. Mass production of forged copper parts offers maximum savings for CFS Forge clients. Conversely, smaller quantities of copper forgings can prove to be the most economical when specific design problems, such as leak integrity, close tolerances, high strength with low weight, and non-symmetrical shape, must be resolved. Besides forging, CFS Forge can also provide post machining service, which will enable us to deliver finished copper components to our customers directly. Contact us now for your FRQs on Copper, Brass or Bronze Forging Project!